An introduction to the countryside immortalised in paint by John Constable, England's best known and most popular painter. Alwyn Crawshaw visits some of the scenes and locations made famous by John Constable, and paints the scenes as they are today. The beautiful locations, fascinating history and the stories behind Constable's best known paintings make this series delightful to watch. Alwyn starts the programme in East Bergholt, where Constable was born, and sketches Constable's first studio. Then, walking between East Bergholt and Flatford, Alwyn sketches Fen Lane in oils, near the site of Constable's inspiration for 'The Cornfield'. 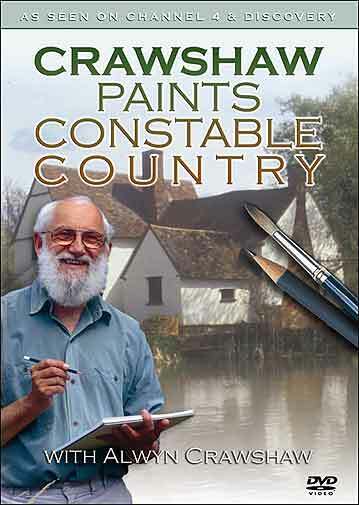 Finally, Alwyn paints Willy Lot's cottage - the cottage Constable depicted in 'The Haywain'. Constable sketched profusely and in this episode Alwyn visits the meadows around Constable Country, and Dedham, where Constable went to school, sketching a stile, a wrought iron lamp post and a distant view of Dedham Church. In this episode Alwyn visits three churches: Dedham Church, East Bergholt and St Mary's in Stoke-by-Nayland. He tells the story of Constable's association with the Church - not always a happy one. Alwyn visits the site of 'The Leaping Horse', and sketches a pollarded willow and a group of ash trees. Constable made over 100 cloud studies and Alwyn does one of his own, in water-colour. The area around Flatford Mill has changed remarkably little since Constable's time. Alwyn visits the site of 'Boatbuilding' and paints a watercolour of the Mill, as well as an oil sketch of a wooden rowing boat. Constable painted Dedham Mill many times, but Alwyn paints a lock-keepers cottage which had not been built when Constable was alive. He also visits Stour House, originally owned by friends of Constable's, and paints a panoramic landscape of Dedham Vale.